The romantic lifestyle of France sweeps across the wide avenues of Paris, the splendid beaches of Cote d’Azur, and the lavender fields of Provence. Embrace the sophisticated ambiance of a candlelit dinner while floating down the calm waters of the Seine River. Relish the private view of the Mediterranean Sea from the comforts of your hotel room. Immerse yourself in the culture of the countryside during a handheld stroll along the cobblestone streets of a medieval village. Your custom romantic France getaway tour accentuates the passion emanating from the landscape and art, cafes and coastline. 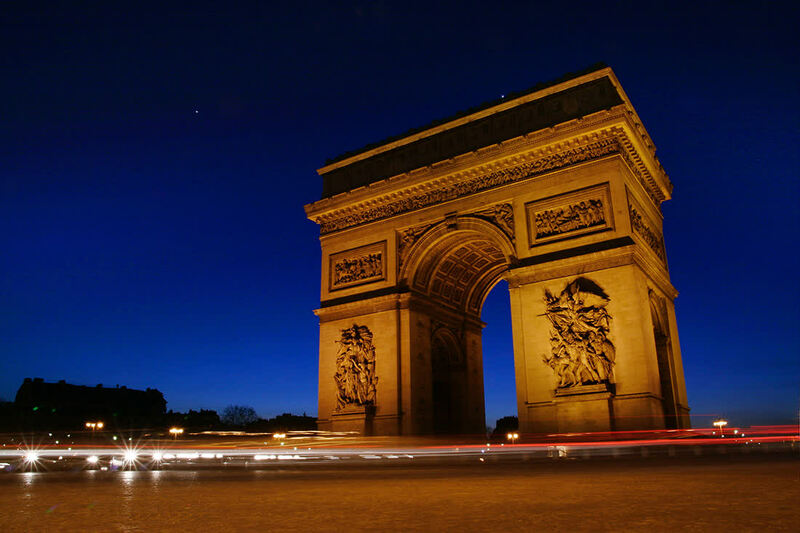 Paris radiates with the romance of iconic monuments and Bohemian allure. Cobblestones pave wide avenues. Diamond necklaces glint in sensational display windows of Cartier, located on the Champs Elysees. Parisians linger in candlelit restaurants at dinner and sip glasses of red wine. 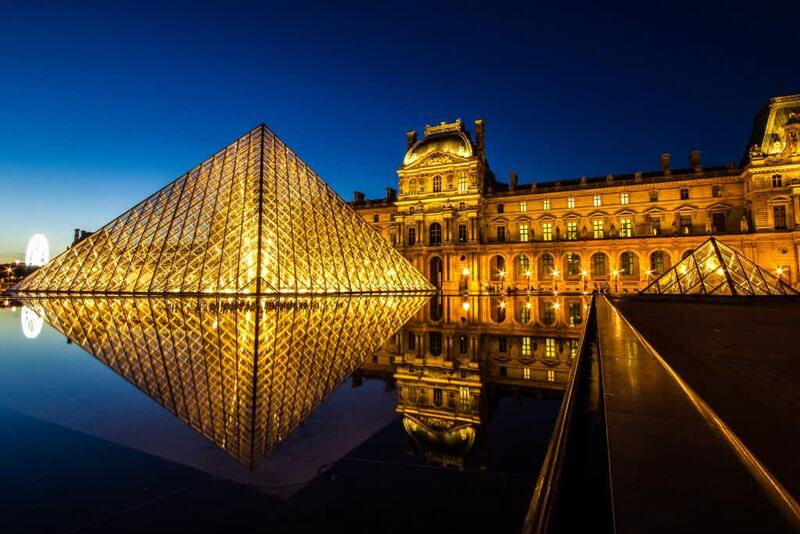 Paris embodies romance with its elegantly lit streets, historic buildings, and passionate mythology, which lends itself to the name, “City of Love.” Your flight lands at Charles de Gaulle Airport, where your private transfer awaits your arrival. The pearled façade of Basilique du Sacre Coeur glows in the evening light crowning the hill of Montmartre. 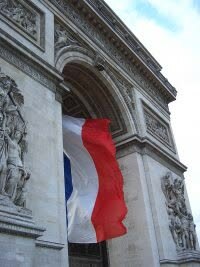 You settle into your luxurious hotel located near the heart of Paris. Spend your first night strolling around the city to get acquainted with the embracing streets. The Eiffel Tower twinkles with light, rising above the public space of the Champs du Mars. The tower was erected in 1889 and stands nearly 1,050 feet tall. The recognizable figure consists of an airy lattice construction that alights with 20,000 light bulbs on the hour from sundown until one a.m. Once the tower is in view, you feel that you have settled in Paris with the one you love. Consider learning more about your France travel agency that strives to craft a romantic experience that will bring a smile to you and your loved one’s faces for many years to come. The elegance of Paris is apparent in the morning light. Locals stroll into local bakeries for freshly baked croissants. Cafes set out tables alongside the cobblestone lanes, perfect for people to watch the rush of the city pass them by. Vibrant macaroons fill window displays of the quiet shops. Your guide meets you at the hotel, eager to lead you on a tour of Paris’s inherent romance, from the antique neighborhoods to the inspiring architecture. You begin in the neighborhood of Marais, one of the oldest neighborhoods in the city. Small medieval lanes wind along the shops and restaurants. Fashionable art galleries open their doors across the alley from a small museum. The wealth of pre-French Revolution architecture blends with a Bohemian ambiance. Henry IV erected the Place des Vosges in the early 17th century. Red bricks, pitched slate roofs, and stones detail the typical Renaissance architecture of the plaza. Victor Hugo resided at number six while writing the 19th-century masterpiece Les Miserables. The nearby 17th-century mansion of the Hotel Salé houses the remarkable Picasso Museum. 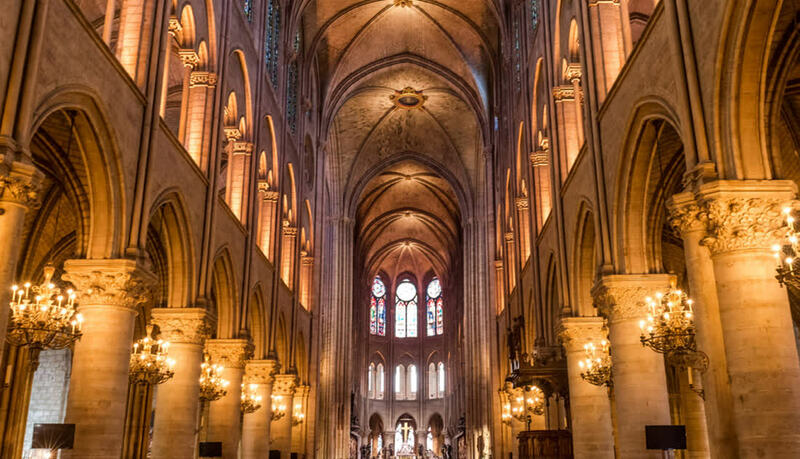 Your guide leads you through the Marais, southwest to the banks of the Seine River, where the famous Cathédrale Notre Dame de Paris stands on the Ile de la Cité, a small island in the heart of the waterway. King Louis IX laid the cathedral’s foundation in the 12th century. The tallest spire reaches a height of nearly 230 feet. The symmetrical towers and rose window at the heart of the western entrance exemplify Gothic architecture. 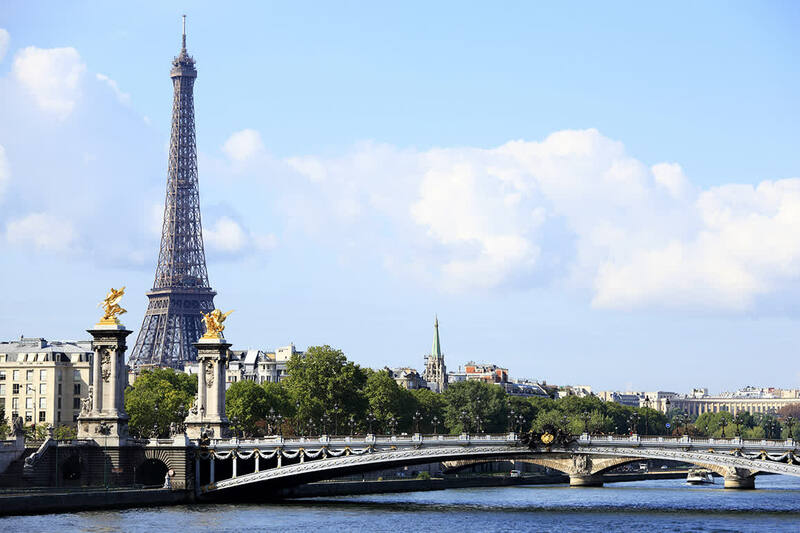 For a perfect view of the structure’s flying buttresses and towers, you stroll along the Pont Saint-Louis. Your time on the bridge offers a private moment between you and your partner, with the iconic cathedral in the background. 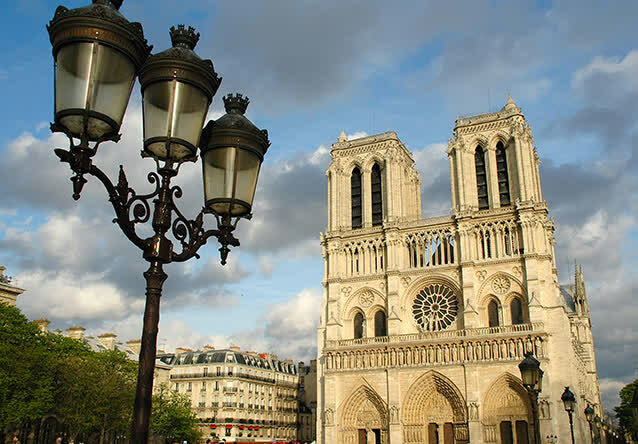 The medieval cathedrals of Paris create an unforgettable skyline rising above the sophisticated apartments and palaces. The imaginative figures of the gargoyles decorating the exterior of Notre Dame de Paris range from stunning winged creatures to unique monstrous figures. The stained glass windows of Sainte-Chapelle offer an unforgettable kaleidoscope of colors in both the exterior and interior. After breakfast, your guide meets you at the hotel and escorts you to the lavish gates protecting the Palace of Versailles. The magnificence of the estate captivates you upon your arrival. Gilded rooftops and upper windows glint in the sunlight. The rosy façade adds a jovial luster to the structure. The estate began as a hunting villa for King Louis XIII. 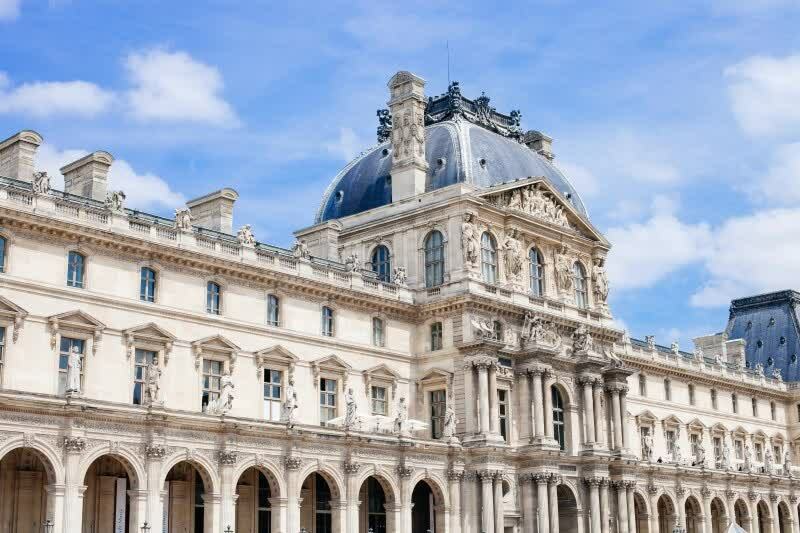 King Louis XIV wanted to create a dazzling display of France’s wealth and elegance, shaping the spectacular Baroque façade, adding immaculate reception halls, and setting the grand standard for royal court in the 17th century. The Hall of Mirrors connects the King’s apartment to the Queen’s apartment. Large windows allow the natural light to fill the passage. There are 300 mirror segments that stand opposite the windows. The sunlight reflects off the mirrors, astounding crystal chandeliers, and lavish gold-leafed statues for a wondrous effect. Outside, you can see the serene ornamental pools of the formal gardens. The sensational scenery is enough to cast partners into amorousness. The aroma of freshly baked croissants and baguettes fills Paris in the morning. Lush trees shine emerald across the decorative pools of the Tuileires Gardens. The day is yours to indulge in the beauty of the city as you and your partner desire. Enjoy the decadent flavor of a fresh hot chocolate accompanied by the light texture and cherished taste of a macaroon from Angelina, Audrey Hepburn’s favorite café in Paris. Stroll through the bright galleries of the Louvre Museum to find the romantic embrace of the statue Psyche Revived by Cupid’s Kiss, with the two lovers immortalized in stone. Wander through the coveted covered markets, including Marché St. Quentin, carrying some of the finest specialty cheeses in Paris. The Neoclassical 18th-century Hotel Biron houses the Musée Rodin. Numerous sculptures produced by the famous artist decorate the formal garden, set beneath shady trees and manicured shrubberies. With more than 300 works on display, including pieces by Renoir and Van Gogh, you can find the famous figure of The Thinker framed by the simple beauty of the red brick building in the background. Rodin began work on the sculpture in 1880, representing the famous Italian poet Dante Alighieri, author of the Divine Comedy. The statue depicts a man lost in thought and remains one of the most celebrated works of Rodin. In the evening, you make your way to the banks of the Seine River. Cobblestone paves the lanes bordering the waterway. 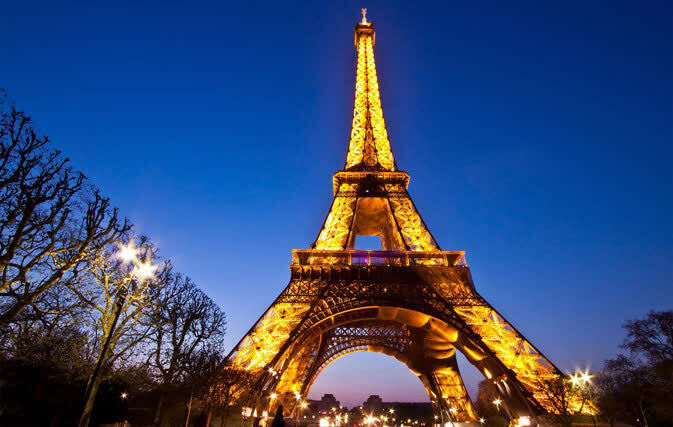 Step onto a quiet riverboat for a night cruising beneath the lights of Paris with a romantic dinner amongst the incredible sites. In the morning, the small bookshops known as Bouquinistes open up on the walkways above the Seine River. The separate stalls stock classic and modern literary works, with a view of the Pont Marie Bridge. Eglise Saint-Germain-des-Prés, the oldest church in the city, stands in the sixth arrondissement. The Merovingian King Childebert constructed the edifice in the 6th century. The early foundation remains, however the structure was rebuilt in the 11th century after a Viking invasion. Paris is unique in its ability to combine romance, history, and culture into a captivating and accessible space. After breakfast, your private transfer escorts you to the Gare Lyon train station for your first-class trip to Avignon. Outside the window, the city disappears behind rolling hills. The hills turn into dramatic mountains in the horizon. Intermittent half-timbered villages and medieval walls pass your view. Once in Avignon, your guide greets you at the train station and leads you on a tour of the marvelous city. Avignon has a magnificent history, having served as the residence of seven Popes and acting as the seat of power for all of Christendom during the Middle Ages. Pope Clement moved the court from Rome to Avignon in the early 14th century. Pope John XXII chose the palace as the papal seat due to its forceful façade and fortress-like complex. The structure maintains a storybook appearance. It remains the largest Gothic palace in Europe with an area of 161,458 square feet. After your tour of Avignon, you settle into an enchanting village in the Provencal countryside. In the morning, you wake up to the charms of a typical 18th-century Provencal farm estate. The rooms nestle against nearly 57 acres of lush vines. Cypress trees border the driveway, and antique olive trees grow across the landscape. The aroma of fresh lavender encompasses the grounds. You and your partner enjoy a rich cappuccino with breakfast. Bask in the marvelous image of the French countryside before beginning your tour. Isle-sur-la-Sorgue rises out of a split in the Sorgue River, which surrounds the town like a moat. On market days, such as Sunday and Thursday, vendors selling handcrafted goods and local produce fill the antique streets. The zesty aroma of oranges and lemons emanates from the produce stands. The 12th-century church has a Baroque interior. Gilded statues swirl around the nave. Upwards of 70 antique giant wheels line the 18th-century canals. The wheels powered the historic silk factories and paper mills. Little bridges cross over the river where you can see the water rushing past town. The grounds around the village of Menerbes have been inhabited since prehistoric times. An ancient cemetery near the city walls dates back to Roman times. The medieval walls were erected in the 13th century. Restored old homes bring the past to dramatic life. Ivy drapes across the antique stone. An ancient convent accentuates the quality and charms of the village overlooking the verdant trees of the Luberon Valley. The French countryside lends itself to pure romance. The morning light washes over the verdant fields. Cypress trees sway in the gentle breeze. The ever-present scent of lavender is refreshing. Today you continue your exploration of the majestic beauty of Provencal villages beginning with the whitewashed buildings at Gordes. The stone rises out of the plush trees growing along the edge of the Plateau de Vaucluse. The village spirals around the rocky outcrop. Tall houses run along the climbing streets. Old doorways radiate from the white and gray stone. The Abbey of Senanque hides beneath the verdant canopy of the valley. Lavender fields blossom with bright purple petals. The elegant 12th-century arcade wraps around the inner courtyard. In the village of Roussillon, you find an absence of modern development. A large ochre deposit colors the landscape and the buildings are a rusty-red. Old men play boules at the edge of Place de la Mairie. The tranquil atmosphere guides you through the shops and cafes. An orange colored path leads you through the bright ochre canyon outside of the village, where you can look back and see the hues shining against the trees. In the morning, the breeze rustles the leaves and the vines spreading across the estate. Your private transfer greets you in the lobby of the hotel and leads you on a scenic drive through Provence en route to Cote d’Azur. You stop in the delightful city of Aix-en-Provence, birthplace of famous artist Paul Cezanne. The sun-drenched city maintains a relaxed pace all year round. Cobblestones line the lanes. 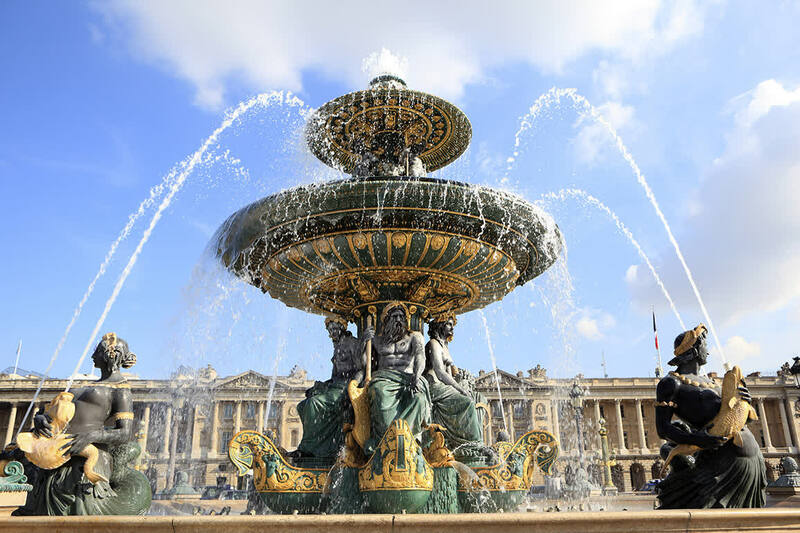 Fountains cast a refreshing spray across majestic public squares. Therapeutic waters fill the antique baths of Thermes Sextius, a modern spa built on the foundations of the luxurious Roman complex. The city maintains a village-like atmosphere filled with vibrant aromas, quiet streets, and bustling cafes. The main street of Cours Maribeau contains four contrasting fountains. The 19th-century Rotonde Fountain adorns the center of the streets southern edge. The fountain has a diameter of 134 feet with two basins. Four lions guard the lower pool. Cherubs of cast bronze ride on swans. The lavish décor embodies the beauty of the city but contrasts Aix-en-Provence’s relaxed ambiance. Enjoy a quiet wine tasting in a cellar located in the heart of the city before continuing to your hotel overlooking the shimmering waters of the Mediterranean Sea. In the morning, the semi-sweet aroma of the Mediterranean Sea drifts into your room. The serene sound of lapping water emanates from the rocky shoreline. Pines and Riviera palms grow along the undulating landscape. Your room is located in a historic villa offering a private view of the azure water. Your private transfer is at your disposal, allowing you to visit the cities of Cote d’Azur at your pace. Nice has inspired impressionist painters of the late 19th century and beckoned British aristocrats searching for a winter home. The streets of picturesque Old Town create a maze of alleyways and cobblestone streets feeding into the spacious boulevards of a more contemporary city. The former inhabitants of the antique neighborhood were fishmongers and grocers. The pleasant aroma of flowers radiates from the morning, with the flower market near the edge of the district. Shops display olives and sheep’s cheese, emblematic of the succulent cuisine of the city, alongside local mushrooms and fresh fish. The Baroque exterior of the Palais Lascaris houses the Lascaris-Vintimille family. Furnishings from the 17th and 18th centuries, along with Flemish tapestries and rich stuccowork, decorate the opulent interior. The palace exemplifies the artistic heritage of Nice and the Cote d’Azur. Stroll alongside the narrow passageways or hand in hand down the coastal Promenade des Anglais for an immersive look at the city. A waterfall in Nice trundles over the cliffs of Castle Hill and mists the air around the fountain’s pool. The beach clubs glow with candy-striped umbrellas set against the turquoise water and golden sands. At breakfast, you and your partner have an unadulterated view of the countryside of Cote d’Azur. The day is yours once again to explore the beauty of the coastline and rugged mountains framing the luxurious cities and enchanting towns. You venture to Grasse, the home of perfume. The industry began in the 1500s after perfumed gloves were invented to help tanners during the dying process. The aroma of jasmine, mimosa, and orange blossoms fill the streets. Budding flowers encircle the town. In the old town, tiny streets wind around 17th and 18th-century buildings. Ancient steps pass beneath arched tunnels. The porous limestone hills give way to natural grottoes filled with pools and waterfalls. The 18th-century modern glass structure of the Musée International de la Perfumerie houses a history of artifacts, bottles, videos, and vintage posters of perfume’s history, which coincides with the history of Grasse. Olfactory stations accentuate the aromas around the region that have captivated people from around the globe. The town of Eze stands more than 1,400 feet above sea level, overlooking the jeweled Mediterranean Sea. Quiet cobblestone streets wind through little boutiques and small courtyards. The buildings open to a tremendous view of the coastline. Sculptures and vibrant plants fill the Exotic Garden. You can enjoy a private stroll along the ruins of an 8th-century church exemplifying the Baroque tradition. Fishing boats fill the natural harbor in the picturesque village of Villefranche-sur-Mer. Cheerful buildings of Italian design overtake the waterfront. Olive groves border the village streets alongside banana trees. After breakfast, the day is once again yours to relish the beauty of Cote d’Azur at your leisure. Spend time relaxing on the famous beaches of Antibes. Clear turquoise water laps at the gold sand of Juan-les-Pins coastline. Bright orange and white umbrellas create the perfect shade along the sun-drenched shore. Old Town Antibes glows with honey-hued medieval stone walls and orange-shingled rooftops. Gourmet shops and cafes look out to the tranquil sea. Bougainvillea drapes across the alleyways. The Chateau Grimaldi houses the celebrated Picasso Museum. The 13th and 14th-century defensive towers provide a dramatic exterior. The interior offers insight into the artist’s life during his time living on the Cote d’Azur, highlighting the context of Picasso’s creativity and Joie de vivre. The museum displays 245 works attributed to Picasso, including the painting, The Goat. In the morning, the sunlight pours through your window, once again highlighting the majesty of the landscape and the allure of the sea. The town of Peillon watches over the Paillon Valley, nestled into the sheer cliff. Medieval cobblestone lanes bisect the old world charm of the perched village. Olive mills and a tiny chapel adds to the historic ambiance. The magnificence of Cote d’Azur is endless, filled with the charms of hillside towns and the lavishness of cities such as Monaco and Cannes. After breakfast, your private transfer escorts you from your accommodation to Nice Cote d’Azur International Airport for your flight home.